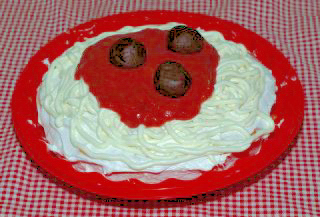 Spaghetti party cake with meatballs. 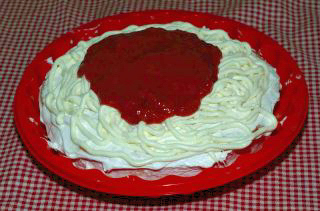 If your kids love to cook they will love this Spaghetti Party cake. Whether it is for a birthday, a kids cooking party or just for fun, kids will delight in this cake. This cake is great for an April fool's idea or backwards party because it is not quite what it seems. Make and bake a round 9 inch cake. You can make it either single layered or double layered. Allow to cool. One cake mix or cake recipe will make two 9 inch cakes so if you don't use both you can freeze one round cake for another occasion. Place cake on serving platter or dish. Frost an even layer of white frosting on the top and sides of the cake. Push frosting through a a potato ricer or use a decorating bag with a round tip to squeeze long noodle shapes. 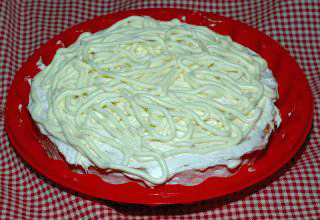 Squeeze frosting out and drape "noodles" over the cake. This doesn't have to look perfect or too fancy because you are just making it resemble a plate of spaghetti. Prepare fudge balls and chill. Meanwhile, puree strawberries in blender and pour over noodles. Melt chocolate chips with condensed milk in a microwave safe dish. Stir together until well combined. Add in vanilla extract. When it is cool enough to handle have kids butter hands. Butter will help the chocolate mixture not stick to your hands. Take a small amount of chocolate mixture and roll into a ball. Place on a cookie sheet or plate and allow to chill. Place "meatballs" on top of your "sauce." Serve.